A website devoted to the descendants of Thomas Ewing Sr. (1690-1747/8) who immigrated from Northern Ireland to Southampton, Long Island in 1718. 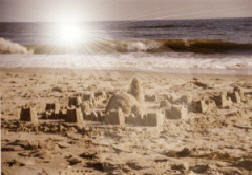 The lives of our ancestors are like SANDCASTLES, scattered in history. the building material of future generations. There are numerous lines of Ewings in America, each of whom contributed greatly to the early development of our country. The purpose of this site is to share information about the descendants of the immigrant Thomas Ewing Sr., born 1690 near Londonderry, Ireland, and his wife, Mary Maskell, born 1701 in Greenwich, New Jersey. Of Scottish descent, Thomas Ewing Sr. emigrated from his home in Northern Ireland to Southampton, Long Island in 1718. Mary Maskells family emigrated from England in the mid-1600's and settled in Connecticut. Thomas and Mary were married on March 27, 1720 and reared their family of ten children in Greenwich, New Jersey. Please feel free to wander around, copy information for your Ewing family files, and allow some American History to come alive through the stories of our ancestors. The book, "Thomas Ewing Jr.: Frontier Lawyer and Civil War General," by Ronald D. Smith is available for purchase through the University of Missouri Press. This is a must-read for all you Ewing Family geneaology enthusiasts! Clan Ewing of America is looking for male descendants of Thomas Ewing Sr. (and other Ewing lineages) who still have the Ewing surname to participate in a DNA Project. Eventually, this information will help solve some of the puzzles about the relationships of the various Ewing branches and their lines in America. You can get more information about this project and read current results on the Project Ewing Surname Y-DNA page of Clan Ewing of America. (A special thanks to Bill Ewing, fellow descendant of Thomas Sr., who is the first volunteer from our Ewing line! We need a few more of you...please help! This site would not be possible without the contributions of information and photographs from many Ewing descendants. Please look at Site Contributors for the lineages and email addresses of people who have made the Ewing Family History site a success. They welcome your correspondence. My direct lineage is as follows: Thomas Ewing Sr. (1690-1747/48); Thomas Ewing (1722-1771); George Ewing (1754-1824); Jane Hunter Ewing (1792-1877); Charles Hyde Latimer (1837-1919); Charles Washington Latimer (1868-1962); Wilbur Latimer (1893-1974); and Dorothy Virginia Latimer (1919-1996). One of the highlights of this site is the 54-page Military Journal of George Ewing, a diary kept during the American Revolution and George's winter at Valley Forge with Washington. Please feel free to contact me with any questions, comments, or errors you may find in the material on this site. Because I have a HUGE problem with SPAM, please follow the CONTACT INSTRUCTIONS below carefully! I welcome correspondence about your Ewing ancestors and have many notes on individuals that are not printed on the site. If you'd like to see photos of my family today, click on The Price-Mitchell's. And, when you're finished here, you may wish to visit Clan Ewing in America, where you can become familiar with many other Ewing lines. Thank you for visiting! Marilyn Price-Mitchell, 6th Great Granddaughter of Thomas Ewing Sr. CONTACT INSTRUCTIONS: Please address your email to: ewingfamily(at)sandcastles.net. Instead of (at), use the @ symbol normally found in email addresses. Because of spam, I no longer have my email address linked on this site. This site is dedicated to my Great Aunt Vernice Latimer, (1904-1993) who often shared accounts of our Latimer and Ewing ancestors when I visited her as a child in Perry County, Indiana. A talented writer, she left many sketches of our ancestors in columns that were published by the Cannelton and Tell City Newspapers. She did a great deal of genealogical research that has been preserved by our family. She also helped form the Lafayette Spring Chapter of the Daughters of the American Revolution in Cannelton, Indiana, and served as regent from 1932-1934. She donated the land and funds for a new chapter house that was dedicated in 1971, serving a second term as regent at that time. As many of the Latimers and Ewings before her, she was a leader in her community, respected for her integrity and generosity to others.